We are committed to providing the next generation entertainment and the best possible customer experience. Our state-of-the art 9D virtual reality simulators combined with the newest 360 degree movies and games guarantee the best VR experience. We are always looking for shopping centers and other places to expand. Our target market is primarily the United States and Europe. Our target location is a highly trafficked location, preferably next the food court and stores frequented by kids, teenagers, young adults. Are you interested in a franchise? Contact us for more details! 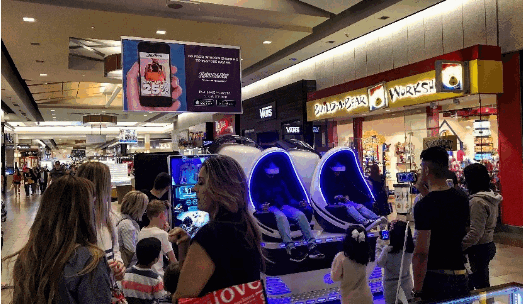 Our high-tech 9d virtual reality simulators are a great addition to any retail property or a highly trafficked area. Our VR experience can also make people excited at events and conferences.